A simple piece of code has apparently helped Her Majesty’s Revenue and Custom (HMRC) block 300 million fake emails last year as part of an effort to tackle the threat from cyber criminals. Despite this, not a week goes by when I don’t get an excited email or phone call from a client after they receive a fake email, pretending to be from HMRC which claims to be a ‘tax refund notification’. This email asks the recipient to click on a link which then requests personal banking details – leading people to unwittingly compromise their financial security. It is a convincing email, it looks the part and you can see why people get drawn in. It look likes it could be true and it is offering them money – so they want it to be true – why wouldn’t they? Everyone wants good news. My wife says you can pretty much apply the same principal to good news as you can to restaurant cream. And trust me the woman is obsessed with cream. When I head home from the office at the end of the day and put in the ‘do we need anything at home’ call, it is rarely milk or bread as you might expect, but almost daily there is a need – a real need – for cream! But as I have learnt to my cost on many occasions, just because it is white and says cream or creamy on the container that doesn’t make it cream. If it comes out of a spray can with sugar added it isn’t cream. If it comes out of a tin it is never cream. And if it isn’t fresh or has added vegetable oils, well, don’t get her started! I would say this applies to food. Just because someone, even someone I know, like and trust, recommends a restaurant, it doesn’t guarantee the food will be good. I learnt the second lesson about whom you ask a few years ago when I was still living in Devon. A know-it-all colleague recommended I try his favourite haunt when I mentioned in passing we would be talking my mother-in-law out for Sunday lunch. You absolutely have to go, he told me, to this golf course hotel because the food was top notch, excellent, really good, they do a cracking Sunday lunch and the price is great. Sounds good, I told him but I haven’t booked so I doubt they will have room. Oh you don’t need to book he says, just turn up they are never too busy. Now there, ladies and gentlemen, is where I should have heard a screaming foghorn and a loud voice shouting ‘STOP’ as it was too good to be true. But sadly, his enthusiasm rubbed off and I thought wow it’s good and cheap and we don’t need to book! The next day we sat tucking into lukewarm reconstituted beef from some kind of shaped loaf probably made from all the bits we don’t want to eat. Smothered in gravy that was without doubt made from a tin of very cheap Oxtail soup with a slight soapy taste and vegetables that looked like they had been frozen and reheated more than once, I cursed myself for my stupidity. I had taken advice from a man I didn’t really trust in the first place just because he was telling me what I wanted to hear. These days it takes more than one person to get me eating somewhere new, as like most people I work hard for my money and I want to enjoy what I spend it on and know I am going to enjoy it. 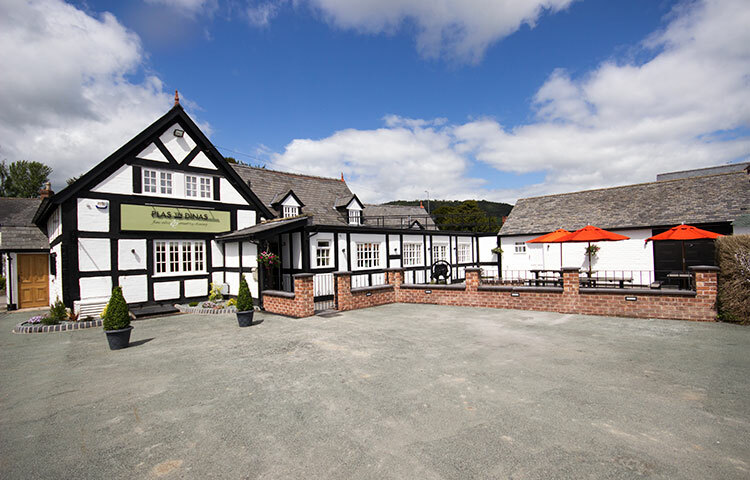 So I have to confess it was months before I finally got around to trying the Plas Yn Dinas pub in my home village of Llanfechain, Powys, despite everybody telling me just how good it is since the revamp and change of hands. I had been to The Lime Kiln in the past when the same people ran it, so I knew the food would be good. And I had seen all the money spent doing up the place, so I guessed the surroundings would be pleasant. But even then so many people kept telling me how good it was I started to think – it can’t be that amazing. Cut forward to a special event, a friend returning to Germany and we find ourselves in the Plas Yn Dinas on Saturday night in late January. I am tucking into a really tasty Tapas starter and my wife has made it clear her garlic mushroom starter is so amazing she is prepared to share it with her one-year-old son Samuel (but if my fork goes anywhere near her plate for a try, things are going to get nasty). Our friend Sophie is a vegetarian who takes the matter quite seriously but the fact she saw the beef meatballs and decided to order them – as they looked so good is testimony not to her lack of resolve but rather to the amazing food. There was a lovely vegetarian option on the menu but as Sophie said, sometimes you want what you want – and in fact we all ordered the same thing – and were not disappointed. The meatballs were tasty, extremely well-seasoned and the sauce and pasta cooked to perfection. There was cheese and so much flavour and best of all it was hot. Now when you have a baby, you have to accept that one of you is going to be eating cold food as keeping a small boy busy is hard. But the woman who runs the place took pity on us, and spirited Samuel away for a few minutes. So for the first time in ages we both enjoyed a hot main course without having to wrestle a baby to stay in his seat. We didn’t make it to pudding as we were just too full after two courses, but I have no doubt it would have been great – and the cream would have been real and fresh, like everything they serve. So sadly you can’t trust the emails from HMRC promising you money – as they are too good to be true. You can however, trust me when I tell you the food, service and atmosphere at the Plas Yn Dinas in Llanfechain is just as good as you have heard, if not better.